I can’t believe it. For the first time in over two years, it appears I may be able to have some malt vinegar with my chips. In the UK, chips and vinegar go together like pie and peas, but in the Netherlands, chips are generally served with mayonnaise. There are a few other options as well. Tomato sauce is popular and chips are also eaten with sate sauce or curry sauce. I’ve even had the opportunity to eat chips with apple puree, but I was never able to find malt vinegar in any of the shops. Not even on the shelves of large supermarkets that had international food aisles. I don’t remember seeing malt vinegar for sale in Spain either and, although I am a big fan of chips and mayonnaise and have been since my first visit to Amsterdam more than 30 years ago, when I was living in the Netherlands I occasionally had the desire to have some vinegar with my chips, especially when I was eating chips I’d cooked myself. 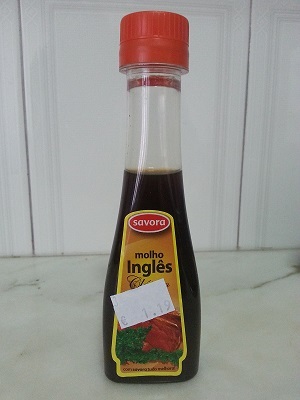 Today, I was in a small Portuguese supermarket and saw a small bottle that said “Molho Inglês”. I don’t speak Portuguese, but when I read the description on the bottle I felt sure I was holding a little bottle of malt vinegar.